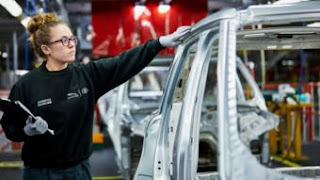 About 1,000 workers at Jaguar's Castle Bromwich plant in Birmingham will move from a five-day to a three-day week from October until Christmas. Jaguar Land Rover said it was making "temporary adjustments to our production schedules" at the factory. It was standard practice to "regularly review its production schedules to ensure market demand is balanced globally", JLR added. It affects about half the plant's 2,000 workers, who will remain on full pay. The move means production of Jaguar cars will slow - many of which have diesel engines. Diesel sales have sunk as buyers question their environmental impact.